I must start by saying I did not come up with this idea on my own. I found it here on a fellow bloggers' site (Bonnie @ Delusions of Grandeur). The moment I saw it, I knew I just HAD to have one! Isn't it precious?!! I followed her DIY and took a few liberties to make it work better for me and my skill set (amateur). Helpful tip: drink wine. First step is fathering your materials. Everything cost be a whopping $22. I bought everything at JoAnn Fabrics so I of course had a coupon (that's a must!). I loved how cheap tulle is! When deciding how much of each fabric I needed, I did exactly as Bonnie said. measured my waist and multiplied it by 4. This is the number you use for each layer. I wanted 4 cream and 2 white so since the fabric was folded in half I only needed to take that number and multiply it by two for the cream and just the one for the black. Confused yet? Ok for example: My waist is 30in. 30 times 4 is 120in. Take 120 and divide it into 3 and that is how many yards is needed for each layer. Since I knew the length was just right with the fabric folded in half, I only needed two of these for the cream and 1 for the black. Hope that makes sense. For the inner skirt, get 2 yards and that should be more then enough. Ok now you take each layer of tulle and make pleats using pins and then sew with a basic stitch to keep it in place. Then right above that stitch, sew a basting stitch so you can gather each layer. I gathered them until they fit around my waist with 1 inch to spare. If you look closely you can see the two stitches and the pleats. Sorry for the bad pic. Once all 6 layers have been pleated and gathered, begin sewing them to one another. Start by sewing your inner most layer to a scrap piece of fabric and keep stacking the tulle until you have all layers sewed together. I then just folded and pressed my satin ribbon in half to create a little pocket to put all the tulle in. This is to help give your skirt a nice clean waistband. I am by no means a skilled seamstress so, like Bonnie I found an inexpensive belt at H&M ($5!) and new that would make everything clean and pretty. The picture below is before the black satin ribbon waistband. Set all that aside and begin the circle skirt. I folded my fabric in half and cut two half circles. One for the waist and the other for the hem. Again, there is a little math involved. I took my waist, 30in and divided that by 2 for the diameter of my skirt which gave me 15in. Then I halved that number again and that is what i used to measure from the corner in a diagonal down. Then I made a mark and used that as a guide to draw a half circle. 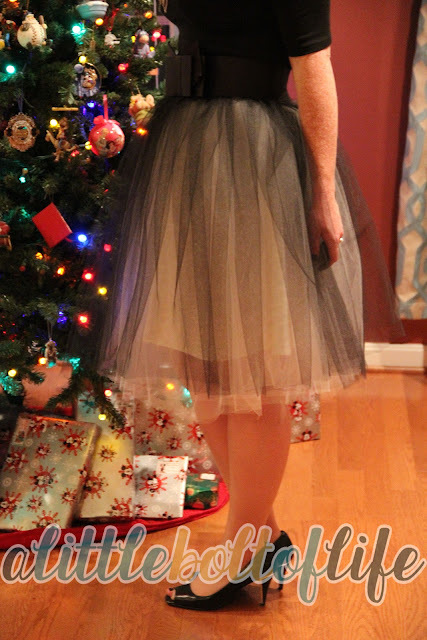 Since my tulle was 27in long I took my tape measure and measured 27 in from the line I drew for my waist. Then made my second half circle and cut. Whew! Sorry I don't have any pictures of all that, but if you need a better visual, just google how to sew a circle skirt. Since I would be sewing the waist to my tulle I didn't bother sewing that part. I sewed the side seam and then the zipper by following the directions on the package. Now all that's left is to hem the skirt. Sew your inner skirt to the waistband of the tulle skirt and your almost done! My circle skirt ended up fitting like a glove, but my tulle was a little big so all I did was sew a small hook about 2 inch in on the tulle waistband to give it a snug fit. Look at that, it's all done! I know that was super long and a TON of info. If you have any questions, please feel free to ask away. I'll do my best to help you. I knew this was not going to be an everyday wear so I was OK with it not being perfect. A few quick things to note: I trimmed the tulle to be closer to the length of the inner skirt, and I only used 5 layers in total. 3 cream and 2 black, partly because my cat destroyed one of my cream layers and I felt it was getting quite poofy. I must say, I was rather happy with how it turned out. What do you think? If you get around to making one send me pics please! As always, I am linking up with Lindsey @ The Pleated Poppy for WIWW. Have a good rest of your week! That looks so fun to wear, and not all that hard to make! ooohhhh how i love this. i will be pulling my sewing machine out soon! Thanks for the tutu tutorial, so pretty! I am pinning this for later! so cute! My cat always lays exactly where I don't want him to as well! Hi Melissa, how are you? I am Ada, nice to blog-meet you. I found your blog through THE PLEATED POPPY and I am loving today's Tutu Skirt. Even better that you made it yourself. The first photo of that awesome skirt by the pretty tree, is so pretty. Happy Holidays by the way. This is the most adorable skirt! If only I was near my sewing machine I'd whip one these up for me! I just recently did a post on that tulle Anthropologie skirt and your skirt is a true contender! Awesome job. That looks like it would be so much fun to wear (maybe make, but then again I'm not exactly super talented when it comes to sewing). You're adorable!